PRISMs to Power the UK. : We [the UK] are going back to the Top Table as far as Nuclear is concerned ! We [the UK] are going back to the Top Table as far as Nuclear is concerned ! Now this is how to deliver a presentation - without hesitation, repetition or deviation - plus a little bit of irony and humour - and with hardly a glance at any notes. 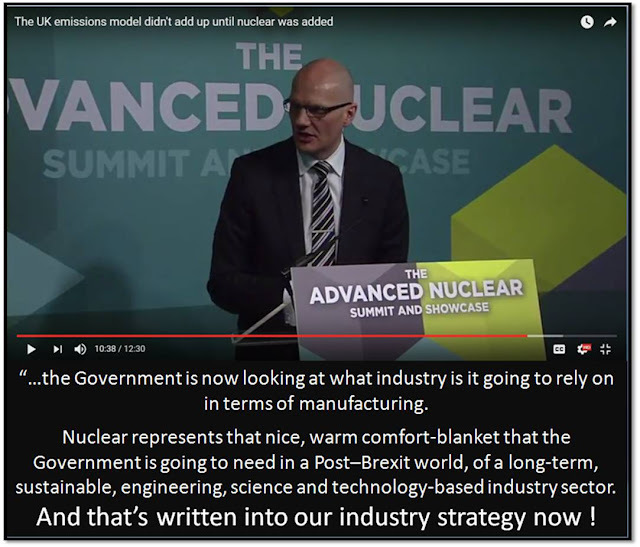 Professor Paul Howarth, Chief Executive of the National Nuclear Laboratory [NNL] implying deals on the future of nuclear have already been done in the Corridors of Power. The most optimistic 12.5 minutes of nuclear commentary on the Web. "…the Government is now looking at what industry is it going to rely on in terms of manufacturing. Nuclear represents that nice, warm comfort-blanket that the Government is going to need in a Post–Brexit world, of a long-term, sustainable, engineering, science and technology-based industry sector..."
And that’s written into our industry strategy now !